GAINESVILLE, Ga. (Feb. 9, 2017) – Brook A. Davidson has been made a partner at Stewart Melvin & Frost, one of northeast Georgia’s largest law firms. Davidson, who was recently selected as a Georgia Super Lawyer Rising Star, joined Stewart Melvin & Frost in 2015. Davidson works with clients to develop estate plans while providing representation through the probate, administration, guardianship and conservatorship process. 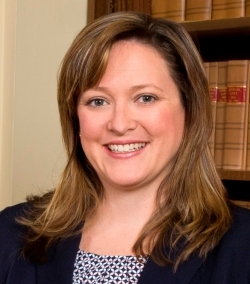 She joined Stewart Melvin & Frost after serving two years as Deputy Director, Chief Clerk and Hearing Officer for the Gwinnett County Probate Court. Her experience also includes work as a probate attorney with Andrew, Merritt, Reilly & Smith in Lawrenceville, Ga., where she managed all phases of litigation from client intake to appeals in the firm’s probate and corporate litigation practices. A Brenau University graduate, Davidson earned her law degree from Georgia State University School of Law. She also is a graduate of the State Bar of Georgia’s Young Lawyers Division Leadership Academy. Davidson is active in the local community, serving with the Brenau University Conflict Resolution and Legal Studies Advisory Board, the Gwinnett Suicide Prevention Coalition, Gwinnett Re-Entry Coalition and the Chattahoochee District Committee of the Boys Scouts of America. She is currently taking part in the 2016-17 Greater Hall Chamber of Commerce Leadership Hall class. Whitney S. Brown has joined the firm as an associate. She will focus her practice on municipal bond and securities law as well as estate planning and probate. A Gainesville native, Brown moved back to her hometown to practice law after working in Atlanta at Kathryn Seabolt, P.C. where she focused on estate planning, wills, trusts and deeds. She served as an intern with Georgia Lawyers for the Arts during law school and later volunteered for the organization. During law school, she also served an externship with the Atlanta Volunteer Lawyers Foundation and an internship with law firm Prater, Duncan and Craig. Brown is a member of the State Bar of Georgia; the New York State Bar Association; and the National Association of Bond Lawyers. Brown earned her law degree from the Georgia State University College of Law, where she was a member of the Intellectual Property Law Society. She also holds a bachelor’s degree in fine arts from the Savannah School of Art and Design. Founded in 1936, Stewart Melvin & Frost is one of Northeast Georgia’s largest and fastest-growing law regional firms. The practice specializes in a broad range of key legal services, including business law, tax and estate planning, municipal bond financing, real estate transactions, litigation, and mediation services. Based in Gainesville, Stewart Melvin & Frost serves a regional client base throughout North Georgia. For more information, visit www.smf-law.com.